Metro-North Railroad locomotives in the livery of the long defunct New York, New Haven and Hartford Railroad. 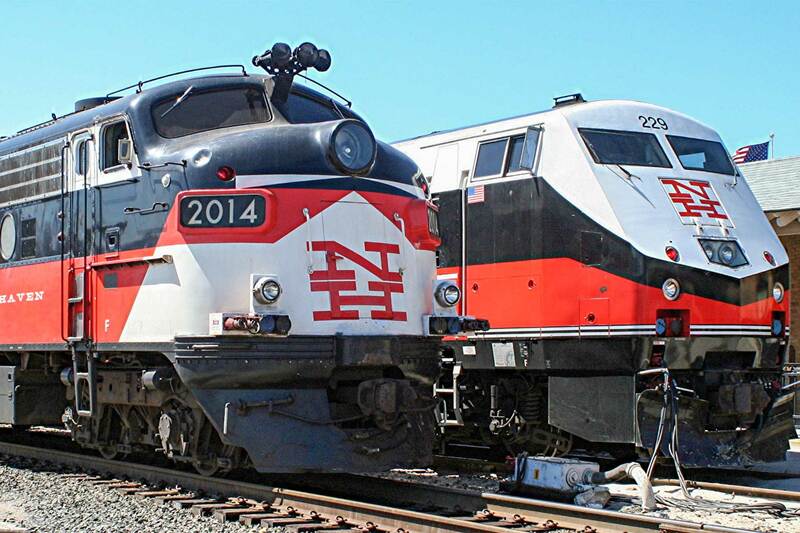 While the locomotive on the left, an EMD FL9, was once built for the New Haven, the new locomotive on the right (a GE P32AC-DM) has been painted in the New Haven livery to celebrate the heritage of today’s Metro-North Railroad. A summer afternoon at the SONO Switch Tower Museum. Join us on a day trip to Connecticut when the ERA visits the Danbury Railway Museum and the South Norwalk (SONO) Switch Tower Museum. The Danbury Railway Museum is housed in the former Danbury Union Station. This station was built in 1903 and used until 1993. It is now restored and looks better than ever. Alfred Hitchcock filmed scenes for Strangers on a Train on its distinctive curved platform. The museum now houses a wide variety of historic rolling stock that can be viewed and explored. We expect to ride the Rail Yard Local, a circuit that includes an active turntable (the only working one in Connecticut) and a tour of the newly restored pumphouse! The South Norwalk Switch Tower shows the inner workings of the South Norwalk interlocking tower that controlled the signals and switches on the New Haven Line between South Norwalk station and the east side of the CP241 Bridge. Our chartered Coach Tours bus will leave promptly at 9:00 AM from the east side of 8th Avenue, just south of West 41st Street, across the street from the Port Authority Bus Terminal. There will also be a stop at the Pelham Bay Park 6 Station at 9:30 AM We will break for lunch at around noon. We expect to return before 7 PM so there will be no dinner stop provided. The ticket price for the chartered bus and the two museum visits is $59. Lunch is not included in this special price, but time has been allocated for you to purchase lunch during our travels.